(MIDDLETOWN, CT) October 4, 2018 – The Wesleyan Media Project is releasing its third post in a series of regularly updated overviews of issue mentions in federal races by state. Below we show the number of ads that aired in House and Senate races in each state from September 1, 2018, to September 30, 2018. We break down the percentage of ads mentioning six key issues tracked by the WMP. Healthcare continues to dominate as the proportion of ad airings referencing the topic rose from 37 percent in August to 41 percent in September. Discussion of taxes takes second in the list, appearing in 20 percent of all ad airings in federal races, followed by jobs (13 percent) and immigration (9 percent). 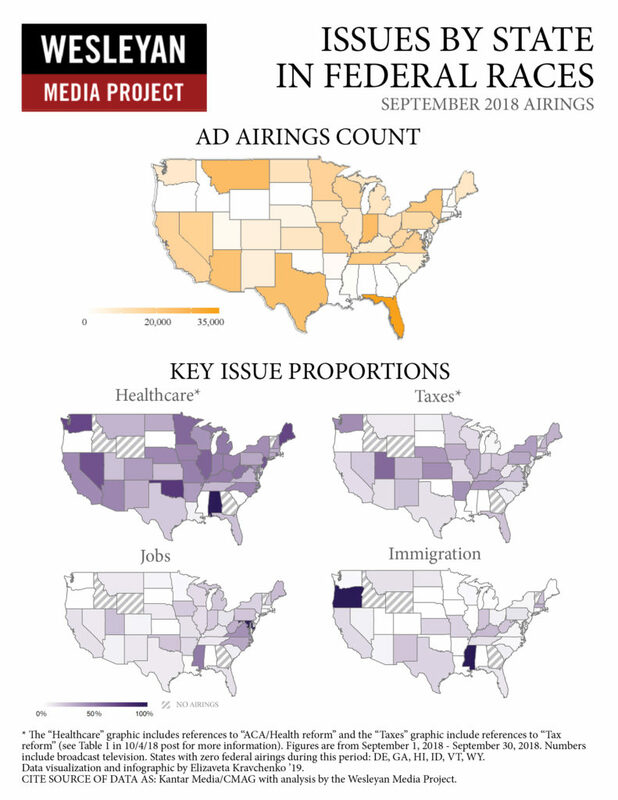 Pro-Democratic airings continue to concentrate on healthcare, with one in every two mentioning the subject, and a fifth of those healthcare ads (10 percent of overall airings) explicitly defend the Affordable Care Act (ACA) and/or attack Republican health reform attempts. Pro-Republican airings continue to split their time between taxes (32 percent, roughly a third of which tout the 2017 tax bill) and healthcare (28 percent), with immigration (17 percent) and jobs (15 percent) fading a bit to third and fourth in the set. Note: this is not a comprehensive list of issues tracked or issues mentioned, and other topics may be discussed more frequently than those shown here. The “healthcare” column includes references to “ACA/health reform” efforts in addition to more general reference to healthcare. The “taxes” column includes references to “tax reform” in addition to more general references to taxation. Percentages across the four main issue columns (healthcare, jobs, taxes, and immigration) may total more than 100 percent because ads often feature more than one issue. † Total includes ads promoting candidates from other parties. Figures are from September 1, 2018 - September 30, 2018. Numbers include broadcast television. States with zero federal airings during this period: DE, GA, HI, ID, VT, WY. Data reported here from Kantar Media/CMAG do not cover local cable buys, only broadcast television, national network and national cable buys. The Wesleyan Media Project is supported by Wesleyan University and the John S. and James L. Knight Foundation. Data are provided by Kantar Media/CMAG with analysis by the Wesleyan Media Project. WMP is partnering again this year with the Center for Responsive Politics, to provide added information on outside group disclosure.